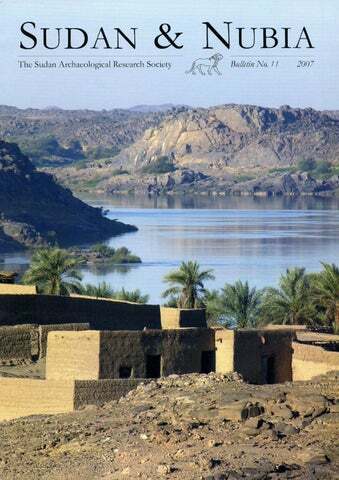 Front cover: Village on the Island of Dirbi in the SARS concession above the Fourth Nile Cataract (photo: D. A. Welsby). Plate 1. The lime furnace. Plate 2. Scudding to remove hair and fats from the skin (photo Elmonter Dafalla). the seed pods of the acacia tree. These pods, called ‘sunt’, or ‘garrad’, by the locals, are ground up and the extract deposited inside the pods, dissolved in the water. Garrad is a highly effective and stable form of ‘mimosa’ vegetable tannin. Mimosa extract is used for tanning throughout Africa, although the tannin is often derived from acacia tree bark (which elicits a higher concentration of tan) and not the seed pods. The tanners at Almyaelik tannery use seed pods, rather than bark, because the pods provide a more sustainable and local supply of mimosa. Removing the bark from the acacia trees would result in the destruction of the precious few trees which grow in this dry region of Sudan. The skins are immersed in the tan-pits for four to six hours, which is all the time it takes to make the leather stable. As soon as they are tanned, the skins can be oiled and dried (Plate 5). However, before drying, some of the leather is dyed. The dyeing takes place in circular baths lined with bricks, similar to the tan-pits. The only colour employed at Almyaelik is a red dye used to give a red/orange coloured leather. Red leather is very popular for making the knife and sword sheaths and leather containers seen commonly in the Omdurman souk. The dye is the only material, other than the skins themselves, which is not produced or sourced locally. It has to be purchased from the souk. Plate 3. The waste pile. bating and entails immersing the hides in a large rectangular pit containing water and pigeon guano (Plate 4). The tanner climbs down into the pit to agitate and pummel the skins, helping the solution to penetrate further into the structure of the skin. In addition, corn husks are mixed into this bath in order to help to rub away the scaly epidermis and remove remaining fats and hair. Small piles of folded goatskins may be seen on the ground near the tanning pits. 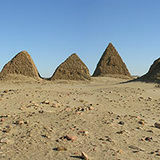 These are not treated in the lime and dung pits, but immersed in tanning solution immediately after washing and scudding. By omitting the lime and bating part of the process, hair will remain attached to the skin, producing furskins, which are used by the local people as simple prayer mats. Plate 5. The drying area. The tanned leather is rubbed with sesame oil and hung up to dry on ropes suspended between wooden poles. The tanning process takes just over one week from start to finish. It is a relatively simple, but highly effective process which has probably changed very little in central Sudan over two millennia. Acknowledgements Plate 4. The bating process. Thanks to the conservation and curatorial staff at the National Corporation for Antiquities and Museums, Sudan, for arranging such a fascinating trip. Also, to Elmonter Dafalla for sharing his photographs with the author, some of which are included in this article. Colour Plate XLIX. Almyaelik tannery.The tanning and dyeing pits (photo Elmonter Dafalla). Colour Plate L. Almyaelik tannery. Sorting the skin after removal from the lime bath. Colour Plate LI. Almyaelik tannery. A tanning pit, garrad seed pods can be seen floating on the surface (photo Elmonter Dafalla).